A special warranty deed can be used to convey title to real property in Oregon. A statutory form for this real estate deed is provided in ORS 93.855. A deed that is substantially in the form prescribed by statute will have the same effect as a warranty deed in Oregon, except that the covenant of freedom from encumbrances is limited to those encumbrances done or suffered by the grantor. Additionally, the covenant of warranty is limited to read "That the grantor warrants and will defend the title to the property against all persons who may lawfully claim the same by, through, or under the grantor." If the grantor in a special warranty deed wants to exclude any encumbrances or other interests from the scope of the covenants, such exclusions must be expressly set forth in the deed (93.855). The statutory form for a special warranty deed is not mandatory. Other forms are permissive and may be used for a conveyance of real property. Before a special warranty deed can be considered for recordation by a county clerk, it is required to be signed by the grantor and acknowledged before any judge of the Supreme Court, circuit judge, county judge, justice of the peace, or notary public within the state of Oregon. No seal of the grantor, corporate or otherwise, is required to be on the deed (93.410). A county recorder will not accept an instrument for recording if it does not contain the original signatures of the person executing the deed and the original signature of the officer before whom the acknowledgment was made (93.804). 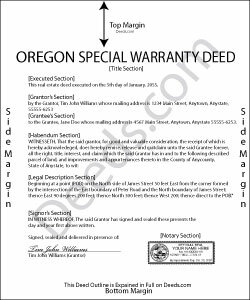 A mandatory statement, provided in the Oregon Revised Statutes 93.040, is required to be included in a special warranty deed. An unrecorded special warranty deed will be valid between the parties to the deed, but will not provide notice to third parties. In order to provide constructive notice of the contents, a special warranty deed should be recorded in the office of the county clerk in the county where the property is located. A special warranty deed that has not been recorded as provided by law is void as against a subsequent purchaser in good faith and for a valuable consideration of the same real property, or portion thereof, whose conveyance is first filed for record, and as against the heirs and assigns of such subsequent purchaser (93.640).